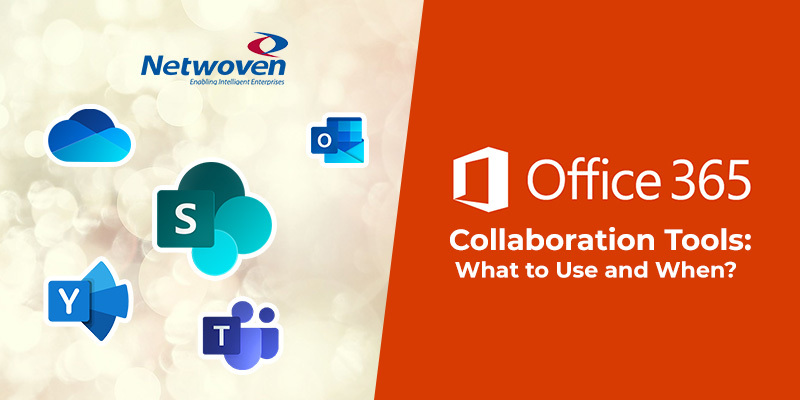 Netwoven Blog Office 365 Collaboration Tools: What to Use and When? I am often asked the question from my customers as to which collaboration tool they should use in Office 365. The confusion is obvious. With the rollout of Office Groups in 2015 and then Teams in 2017, Microsoft has increased the number of Office 365 collaboration tools to at least nine. So, it’s confusing for most customers to decide, which tools to use and when. Moreover, an alarming concern amidst this confusion is poor engagement rate at the workplace. As per Gallup’s 2017 State of the American Workplace, 87% of global employees are not engaged at work and many companies are not even aware of it. So, it’s time for a change. The digital workplace that Office 365 facilitates can reinvent productivity, enhance employee experience, speed up innovation and build competitive advantages. What you experience is a true digital transformation! It puts employees at the heart of their workplace. When a customer adopts Office 365, some of them expect that collaboration becomes engaging and painless. But with a host of tools, employees feel confused. They turn to various approaches and adopt tools as per business scenarios, project requirements, and employee traits. However, with the absence of training and an adoption strategy, the organization still suffers poor collaboration. Collaboration causes chaos: With the limitless collaboration freedom in Office 365, users often end up in collaboration anarchy. The collaboration turns disorganized. The fragment scatters over different tools and becomes inept for reuse. In such a stance, employees do not know how to use Office 365 tool effectively. Lack of collaboration patterns: Let me explain a scenario for this one – say you purchase a corporate-wide subscription with a complete set of Office 365 applications. However, an audit reveals that your employees use only a specific tool like SharePoint. This means other applications stay idle, bringing no value to the organization. Misuse of collaboration: If misused, Office 365 can hinder your working process. Such as excessive chatting, overwhelming collaboration spaces and inconsistent discussions can lead to severe gaps and mistakes in projects. The race for collaboration may lead to broken information and deviate from organizational goals. Guess what! You can avoid these situations and turn your workforce more productive. All you need to know is when to use what. Office 365 Collaboration Tools - When to Use What? There is no doubt that these tools make collaboration simpler, quicker, and transparent. Everyone can include their thoughts and expertise, add value to the work and can speed up decision-making. But the question lingers which tool to use and when? Microsoft has a general guideline about Inner Loop and Outer Loop conversations that explain how to use collaboration tools more proactively. Refer to the image above and see how Microsoft tools map to these loops. Though this is a good way to explain the concept, I find that it is difficult to take that and use it meaningfully for deployment. My definition is a bit different. Here is my guide to break the ice for your business. Teams is basically a chat-based collaboration platform. It brings together all people, content, and tools that a team needs to stay more engaged and effective. For a common project, the entire team needs to be on the same page. They must be able to chat whenever they need, tag or update actions, share files from any location and that too in real-time. In such a scenario, empower your employees with Microsoft Teams. MS Teams is built in Office 365 Groups, so people have access to SharePoint sites created by default for each team. As it is mail-enabled, so you can send emails to respective channels, which everyone in the respective team can access. In Teams, the conversation appears in a threaded format, so you get a chance to go back and review questions whenever you want. Say you want to give a shout out to a major achievement on project completion; or want to put up a question to the whole organization to solve a problem; or want to consider communities of a larger group of people to spread a single message, I recommend using Yammer. At Microsoft, the Yammer groups are centered around certain technologies or areas of expertise rather being focused on a single project. It is a social networking service which works through group-based messenger. You can jump from one Yammer Group to another yet can access the historical data of the earlier group. 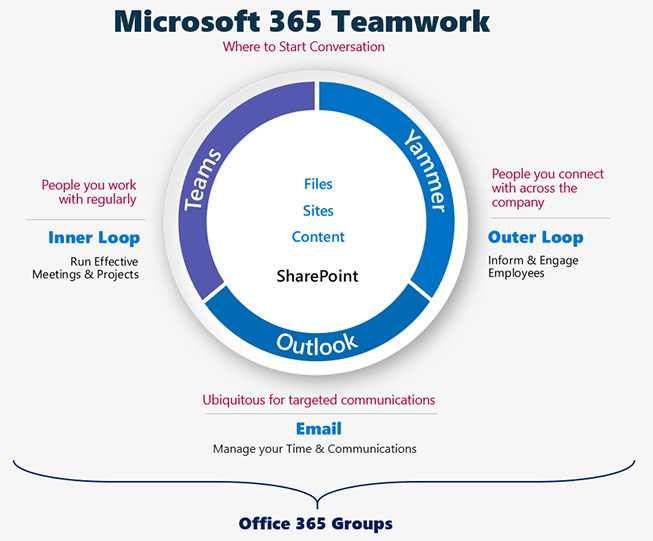 Just like Teams, Yammer is also built on Office 365 Groups. So, the group by default has access to Planner, OneNote, a SharePoint team site, and the document library. We know how frustrating it is to email a document to several people and asking each to add their thoughts. Then think how many versions of the document you will get back. Here, SharePoint has a big role to play. It allows you to work on a single document/presentation at the same time helping to work quicker, providing visibility on the approach others are taking. Moreover, in the last few years, Microsoft has turned SharePoint into a backend repository and container with front end applications like Exchange and Teams. In my experience, the most logical workloads for SharePoint now are Intranet and historical sites migrated from other systems. Some organizations may not want to invest in Microsoft Teams, or they may have other tools like Slack for collaboration. For them, it is better to continue with SharePoint for collaboration purposes. 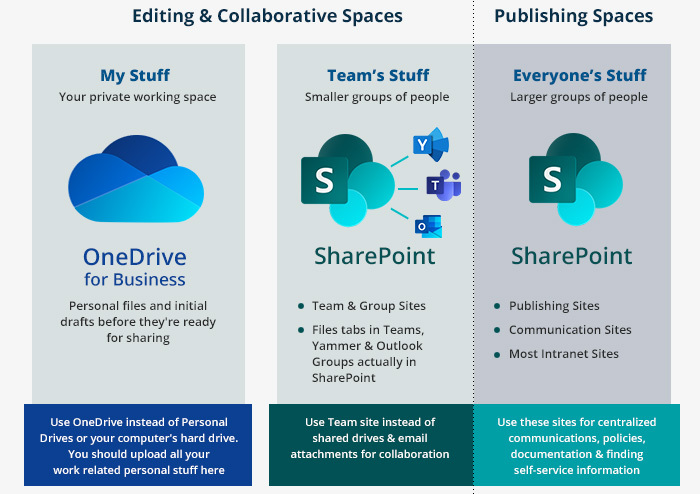 OneDrive For Business is not designed as a collaboration tool but it does allow you to share documents with others and co-author them making it a collaboration enabler. This cloud service will let you save files and documents securely and sync documents to the devices of any kind (mobile, tablets, or any other devices). You can easily upload a document in OneDrive and give other people access to it. You can give permissions at a granular level to allow read-only or edit access. It ensures that employees don’t use unapproved, potentially insecure tools that compromise business security. You can consider this as a personal file sorting and sharing system in the cloud. Let’s be clear, no two workplaces are the same. There is not a one-size fits all approach to collaboration. But there are steps to create a more engaging workspace. Through this blog, I tried to explore each of them in my way. In my subsequent blog posts, I will elaborate on each of these use cases. I have seen the pain points, and the best practices in place to guarantee success first hand. This guide is just the tip of the iceberg. For detailed consultation and support, Netwoven is ready to help!